Caveat emptor is the legal phrase admonishing buyers to beware and the new blend of alcohol and gasoline known as E15 only reinforces that statement. While a 10 percent blend of gasoline with ethanol, known as E10 or gasohol, has been used for years to lessen winter smog with no distinguishable harm to engines, boosting that mix up to 15 percent is another story entirely. Of the 240,000,000 cars on the road, 95 percent of them can be seriously damaged by the use of E15 gasoline according to the manufacturers themselves, claims AAA. A convenience store in South Austin TX had some sort of fueling problem last summer, causing cars to stall out within blocks of the station. Though an explanatory posting never came, we suspected a refueling truck had mistakenly put E85 into an underground tank meant of E10 gasohol. Obviously, E85 gas is meant only for Flex Fuel vehicles, but a nearby gas attendant told us customers occasionally put it in normal vehicles in an unwise effort to save money when refueling. Though just an addition of five percent more ethanol, the sustained use of E15 can potentially cause accelerated engine wear and/or failure, damage to the fuel system, and perhaps even more troubling, false check engine alerts on any of the 228 million vehicles not approved by manufacturers to use E15. More importantly manufacturers are already stating that the use of the fuel may void warranties. BMW, Chrysler, Nissan, Toyota and Volkswagen have unequivocally stated their warranties will not cover fuel-related claims resulting from E15. Ford, Honda, Hyundai, Kia, Mazda, Mercedes-Benz and Volvo insist E15 fails to comply with specified fuel requirements and could void warranty coverage. Is this what a new car owner wants to hear or play around with? No way, José. In fact the fuel is only recommended for flex-fuel vehicles, Porsches built from 2001, 2012 and later GM vehicles and 2013 model-year Ford vehicles, covering cars, light-duty trucks and SUVs. 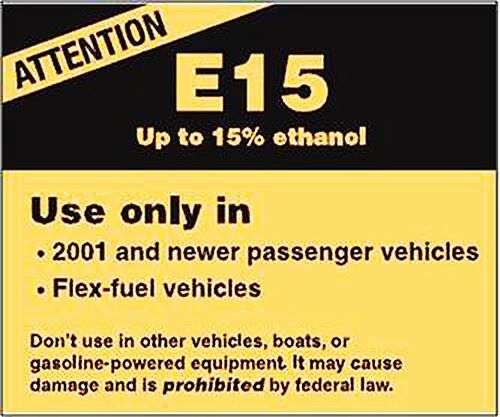 E15 is specifically forbidden in heavy-duty vehicles, boats, motorcycles, power equipment, lawn mowers and offroad vehicles. The EPA approval of E15 was heavily promoted by corporate corn growers, over the objections of auto manufacturers, in a drought year that lowered corn production so much, cattle are being feed ground cornstalks to save money. Gas prices are holding a bit lower these days as the economy improves, so why let E15 kill your car? There’s just no sense to it at all. Oh no, E15 will cause your car to burst info flames! Oh wait 266,000 gas cars burst into flames a year with existing gas. What a bunch of crap. This is all being backed by oil companies that don't want to see their demand reduced by another 5%. The same dumb excuses came out of the woodwork when they originally proposed removing lead from gasoline. E15 will not harm 99% of the vehicles on the road, they need to just do it. no, actually it will cause engine stalling and necessitate the need for a full fuel system cleaning and often the replacement of O2 sensors and several other downstream sensors. Modern computer controlled fuel systems require specific fuel formulas to work properly, fouling up the sensors leads to markedly decreased fuel milage which will cause more fuel to be burned until the fouled sensors are replaced and the system cleaned. Check the price online for a ford flex fuel sensor. (the little probe that tells the computer how to best burn the fuel) Hint: around 700 dollars!!! Easy to see why AAA is concerned as well as the automakers who will get the blame when people start having to do hundreds or thousands in repairs..
And tough cookies to those of us with '72 Bel-Airs, right?